Chikki is loved by all and consumed more in winter as the great sweet taste and crunch keeps you warm. Lonavla is most famous place where Chikki is available. The main road is filled with numerous Chikki shops, the most famous being Maganlal Chikki shop. Makar Sankranti is the kite flying festival celabrated throughout the country on 14th January and chikki is the special sweet consumed on this auspicious day. Making the perfect chikki is an art that requires a bit of practice to master, but it is totally worth the effort because the crispness and rich flavour of homemade chikki is much superior to any store-bought one. Plus, when you make the chikkis at home, you can use a blend of different nuts in the proportion that you wish. Think chikki, and peanut chikki is the first option that comes to mind! Indeed, the combination of peanuts and jaggery, prepared in a crisp and exciting form, is a time-tested and ever-popular snack, which has won the hearts of Indians and others. Til and Dry Fruit Chikki, a tasty and energy-dense bar, which you ought to carry around in a small box in your handbag, if you tend to feel tired often! Rich in nutrients like protein, iron and vitamin E, this Til and Dry Fruit Chikki will beat fatigue and satisfy your sweet tooth in one shot. Kurmura Chikki, with its wonderful crunch and puffy texture is loved across generations! Light yet satiating, this tasty chikki is also easy to prepare, with minimal ingredients. Using jaggery instead of white sugar retains the traditional charm of this recipe, and also imparts a very rich and complex flavour to the puffed rice chikki. Use oats and walnut and sweeten with jaggery to make this super Oats Walnut Chikki which is made using healthier ingredients. 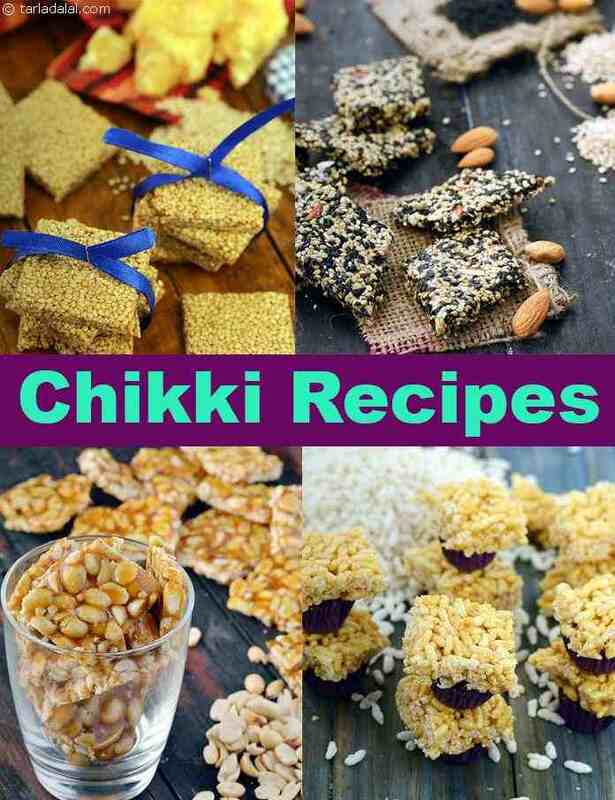 We hope you enjoy our Chikki Recipe Collection. Given below are Indian Dessert articles you will love.